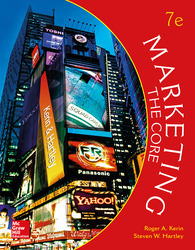 Roger Kerin and Steven Hartley’s Marketing: The Core is a more brief, 18-chapter version of their Marketing, the most rigorous and robust program on the market published in 19 countries and 11 languages. New for the 7th edition: --Coverage of analytics and data added across several chapters, --New cases featuring Coppertone, GoPro, and a completely updated Mall of America case --Updated chapter openers, cases, and discussions throughout to reflect current topics like virtual reality, binge-watching, customer-centricity, native advertising, and more.The 7th edition also continues to demonstrate the Kerin/Hartley commitment to engagement, leadership, and innovation: Engagement in class-tested, active learning activities (located throughout the Instructors Manual) to help instructors illustrate textbook concepts. Media-enhanced PPT slides, alternate cases, and a 5,000+ item test bank, and more are included in the comprehensive resource suite. Leadership in leading, current content, with new emphasis on marketing metrics and data-driven decision-making, with hyperlinked assignments throughout help instructors easily correlate activities. Innovation in outcomes-oriented Connect®, including SmartBook, Application Exercises, and new Mini-Simulations and New Marketing Plan Prep exercises help prepare students to write successful marketing plans.